FamilyLink is a touchscreen tablet device, activity-monitoring system, and social network designed specifically for the older generation. It provides older adults with one-touch features such as email and video chat, and it provides a loved one and/or a caregiver with prompt email or SMS alerts if an unexpected absence of activity is detected in their home. The FamilyLink device is a dedicated appliance that arrives pre-configured to run the senior-friendly FamilyLink software. There are no apps to download, no email spam, and no pop-up windows. Once it is installed in the user's home, they just turn it on, and they have access to one-touch features that will help them stay better connected with family and loved ones. Once installed, FamilyLink monitors device usage and tracks activity in the room in which it is located through its built-in motion detection. Caregivers can easily set "Notification Thresholds" on the FamilyLink web site so that activity notification alert emails or text messages will automatically be sent to the caregiver if the user's activity falls outside of their normal routine. What benefits will I get out of FamilyLink? 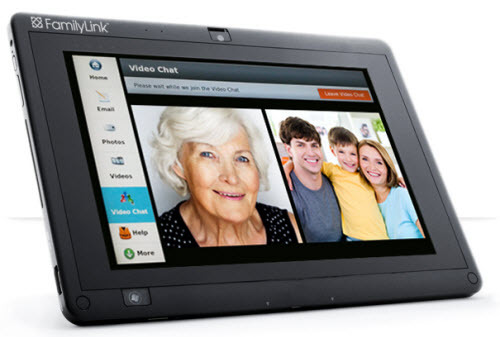 Older adults love FamilyLink because it enriches communication between families by removing technological barriers. They can share email, engage in video chats, and view photos of family and friends, without needing to use and maintain a computer. FamilyLink is a safe environment that is protected from internet intrusions, unwanted emails, scams, and popups. It is designed in such a way that users can't press the wrong button or get frustrated by new programs changing everything. What benefit will my family members get out of FamilyLink? FamilyLink provides peace of mind to family members and/or professional caregivers by providing real-time information about a loved one's wellbeing while respecting their privacy and dignity. What makes FamilyLink different from a computer? The FamilyLink device is a dedicated appliance that arrives pre-configured to run the senior-friendly FamilyLink software. There are no apps to download, no email spam, and no pop-up windows. It provides many of the benefits that older adults want, without the headache of maintaining a computer. Also, unlike a computer, FamilyLink provides activity monitoring that will automatically alert a loved one if an unexpected lack of activity occurs. Can hackers or viruses attack my FamilyLink device? Safety and privacy are important issues for any computer users, but they are especially important for older adults, who can potentially be more vulnerable to malicious scammers or predatory sales tactics. 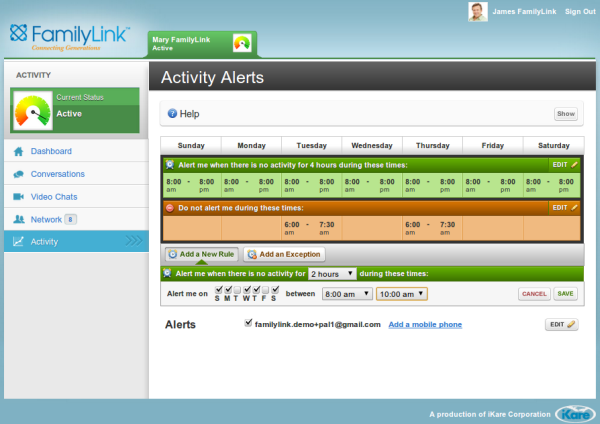 With FamilyLink, only approved friends and family members may engage with the user. Any email, photos, or other content that comes from an unknown user is blocked by the FamilyLink server. Also, because FamilyLink is running dedicated software, the device is not susceptible to viruses or other hacking attacks. FamilyLink is installed in a frequently-used room (such as a living room or kitchen), so that the built-in motion detector will be activated as the user go about their daily activities. The installation process involves connecting the device to power and linking it to a wireless network. The process is fairly straightforward, but installation by someone who is reasonably comfortable around a computer is strongly recommended. Can I control what hours activity is monitored? Yes – a family member and/or caregiver who is receiving email or text message notifications can easily configure the activity notification rules from the FamilyLink web site. The web site also provides a dashboard that shows past activity levels. Can I install multiple family links in the same house? A user can install multiple FamilyLink devices in the same home or apartment building. Each device has a unique digital identification, and multiple devices can operate on the same wireless network. What are the advantages over pendant-style systems? With FamilyLink's ambient monitoring technology, an older adult is not required to wear an embarrassing or uncomfortable pendant device. FamilyLink is a pleasing addition to the home, and it respects the user's privacy and dignity. 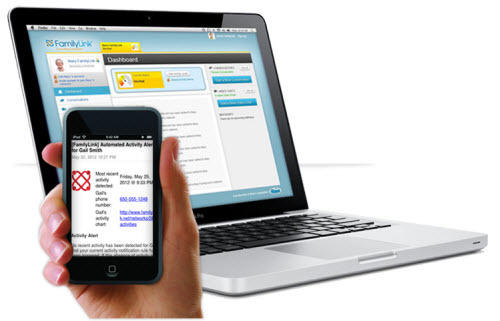 In addition, FamilyLink does not require the user to press a button – something older adults may be unable or reluctant to do, even in an emergency. It automatically alerts a loved one if an unexpected lack of activity occurs. 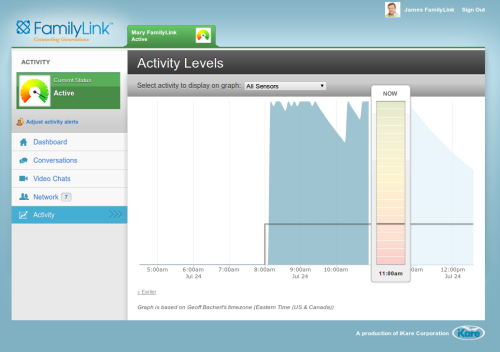 The inventor of FamilyLink, Greg Gutt, experienced the benefits of ambient monitoring shortly after installing the device in his father's home. He received an alert at 9:00 in the morning, an hour after his father was normally out of bed and making breakfast in the kitchen. When Greg called his father, there was no answer. He then phoned the neighbor, who discovered that Greg's father was unconscious in bed and was suffering from an insulin reaction. Help was brought in immediately, and by the end of the day everything was fine – all thanks to FamilyLink. What trends do you see in ageing in place? Consensus is growing among aging experts that older adults are happier, healthier, and live longer if (1) they are able to stay in their own homes, and (2) they are able to stay socially engaged with friends and family. It is the mission of FamilyLink to foster the well-being of seniors by enabling them to safely and pleasantly remain in their homes, while providing the technology tools that will bring peace of mind to loved ones and caregivers. Is it possible to link FamilyLink with home automation systems? Prior to becoming President of iKare in July 2011, Michael spent several years advising iKare as a member of the company's Board of Directors. Michael, the former CTO and CEO of Novariant, was drawn to iKare in part because of his own strong dedication to using technology to pioneer new solutions to everyday problems. Michael was named by Technology Review Magazine to the TR list of top young innovators of 2003, and was inducted into the Space Technology Hall of Fame in 2006. He holds a Ph.D. from Stanford University and a B.S. from MIT.